Leicester City Football Club at Quorn – well nearly! Leicester City Football Club were formed in 1884 and were initially known as Leicester Fosse Football Club, because they played on a field on Fosse Road in Leicester. Financial scandals caused the team to be disbanded in 1915, but they reformed again after WW1 as Leicester City Football Club. 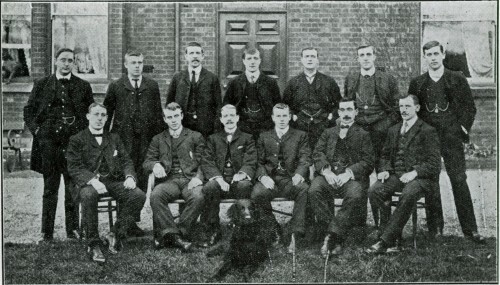 This newspaper photograph shows the Leicester Fosse team in 1904/05, standing in front of the Manor House Hotel on Woodhouse Road in Quorn. The hotel was run by keen Quorn sportsman James Alfred Hartopp, who is standing on the back row on the far left of the group.